Robin Tanner an English artist, etcher and printmaker. He lived in London, and at Kington Langley, in Wiltshire. His studied etching at night-school classes at Goldsmiths College in London. 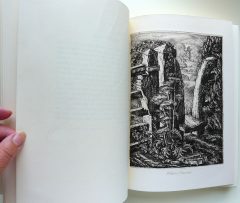 He had been inspired by visiting the Samuel Palmer retrospective exhibition organised by Martin Hardie in London in 1926, and his first etching was made in that year. He was particularly moved by Palmer’s early period Shoreham works which had been so influential on fellow students such as Paul Drury, William Larkins and Graham Sutherland. 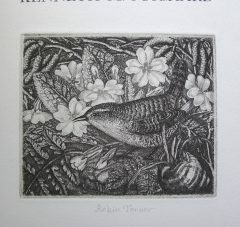 Tanner was thus part of the etching revival in England, but the market for etchings collapsed following the economic depression of 1929, and by the growing use of photography for illustration. Tanner turned to teaching to earn his livelihood. His passion for teaching fine art to young children was infused into many English counties through his role as H.M. Inspector of Schools in primary schools from 1935 to 1964. Tanner believed that the study of natural things and the exploration of arts and crafts, music and poetry were essential for the development of teachers and children. At the Ministry of Education, he ran courses for primary teachers, often with Christian Schiller. Following his retirement in 1964, Tanner took up printmaking again with dedication. He also illustrated a number of books, collaborating with his wife, Heather Spackman, whom he had married in 1931. Wiltshire Village was reprinted as late as 1978, and became a best seller. In 1932 they had moved into the house they built outside Chippenham, Old Chapel Field, where the diarist Francis Kilvert’s ancestors lie buried. They lived there for the rest of their lives. He was a founder and benefactor of the Crafts Study Centre, now at Farnham, Surrey. He was awarded an Honorary Degree (MA) by the University of Bath in 1977. His later work, such as Woodland Plants, shows the influence of William Morris.